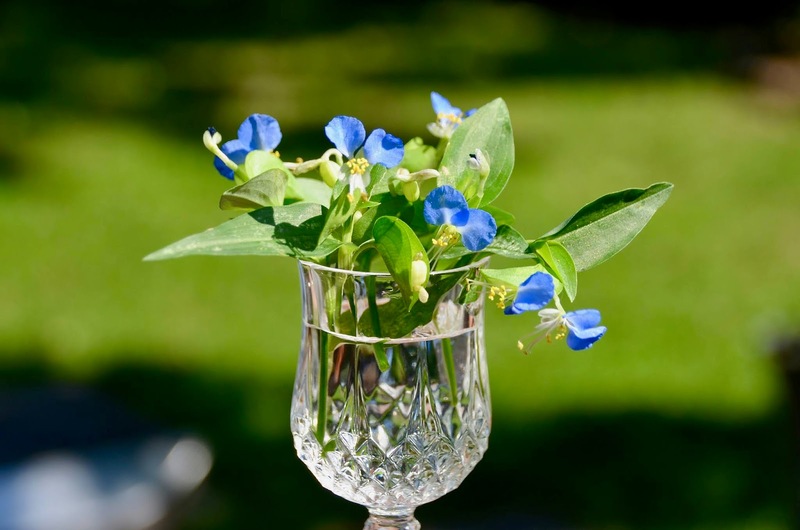 Do you recognize these flowers? Click to enlarge. I am seeing them lately on lawns, and in parks and fields. Some people call them mouse ear flowers for the two blue petals. They are also known as Asiatic dayflowers, Commelina communis. They are introduced and invasive in the U.S. and reviled as weeds, but let's put that aside for now. I'm working on a project with plants and have been brushing up on botanical terms and flower parts. I took a closer look at these flowers. My first reaction was, huh, what is all this stuff? There seem to be too many parts here. I was expecting stamens around a pistil like in a tulip. So I took a close photo and read up on this wonderfully complicated little flower. To begin with, there are three petals. 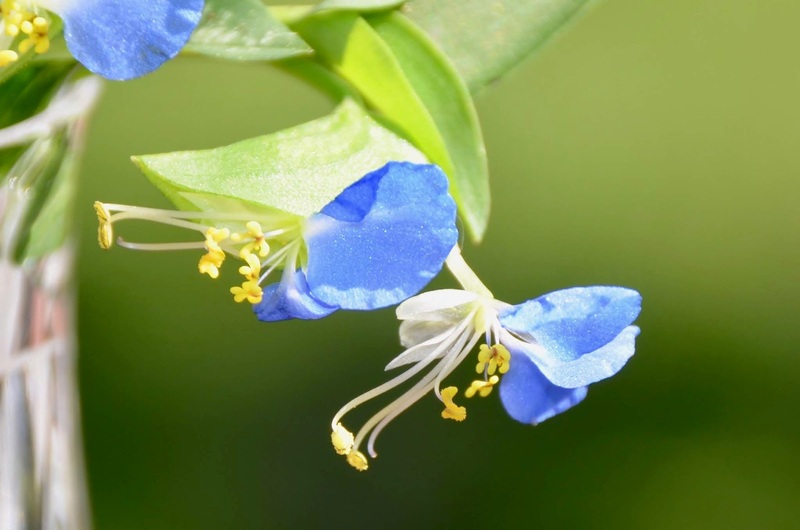 There is a small white-colored one below the blue ones and behind the thready white and yellow reproductive parts. 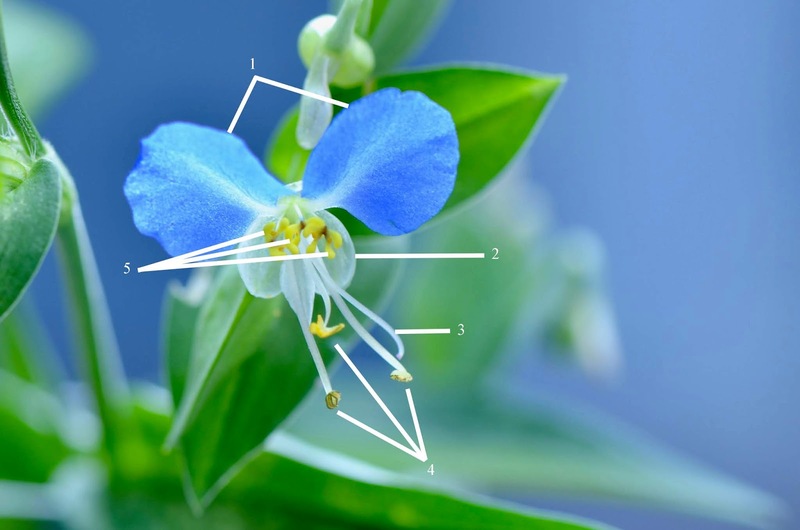 As for them: there are five stamens here. The three that look like little yellow flower faces across the top are infertile, just for show, to attract pollinators. The three long filaments with fuzzy yellow pollen-covered anthers on the end are fertile stamens. The long white thread that curves around on the right in this photo is the female style with stigma on the tip: it will catch pollen eventually that will grow down the tube to the ovary at the base to start a seed. Phew. Here's a diagram if you are following along at home. 1 = two blue petals. 2 = one inconspicuous white petal. 3 = one style (female part). 4 = three fertile stamens (male parts). 5 = three infertile stamens (tricky parts). 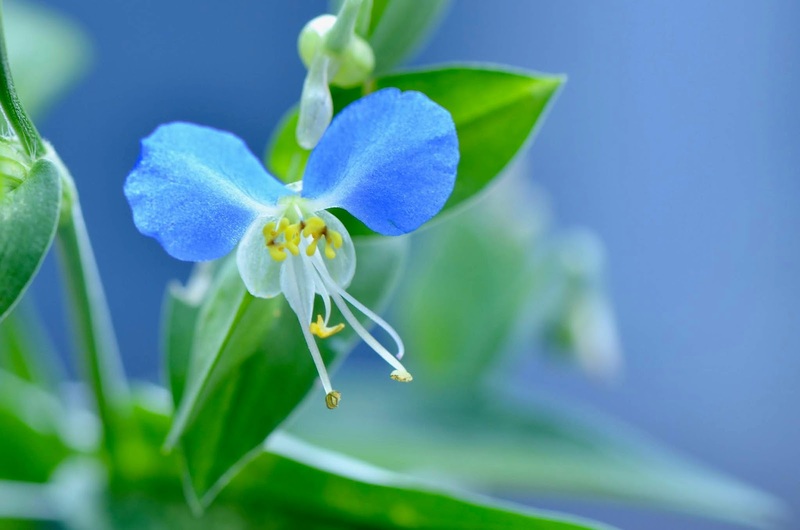 And it is called a dayflower because each flower blooms for one day. I took these pictures this morning. The entire bed where I plucked them is flowerless now as dusk approaches.